A cracking filly with the pedigree to match! After days of looking through the yearlings on offer at the Magic Millions Gold Coast Sales we were thrilled to buy this cracking filly by multiple GROUP 1 winning sire Helmet. After valuing her between $90,000 – $120,000 and with a bidding limit set at $120,000 we were astounded to be able to pick up this daughter of Helmet for just $70,000. Of course Helmet is known by Australian racing fans. He was a dual GROUP 1 winner as a two year old winning the time honoured Sire Produces Stakes and Champagne Stakes at Randwick. 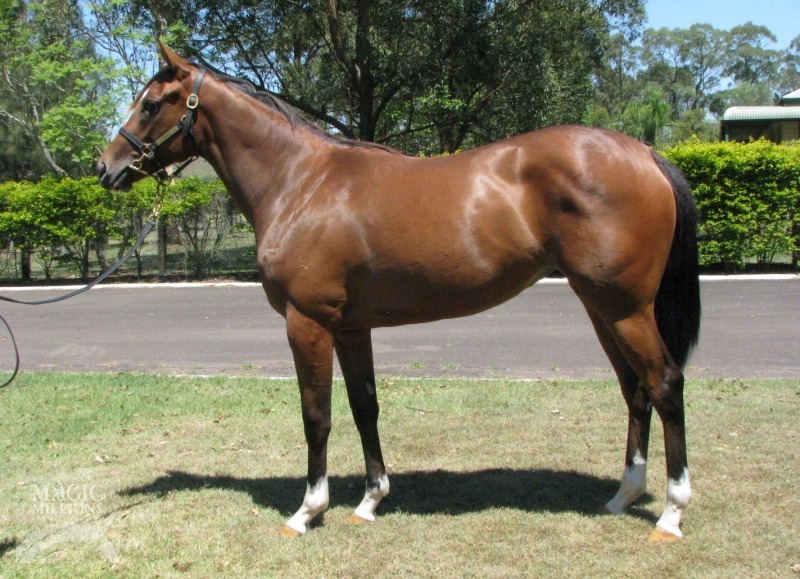 He then trained on as a three year old winning the GROUP 1 Caulfield Guineas in track record time. That performance earned him a timeform rating of 127 – that’s higher than his sire Exceed And Excel and higher than his champion grand-sire Danehill. The filly is out of multiple city winning Scenic mare Eliza Park who has produced six foals to the races and they ALL have been winners! More importantly one of these winners is the stakes winning filly GABBIDON who won the GROUP 3 MRC Thousand Guineas Prelude. The filly is a lovely strong type, very correct and she walks just beautifully. Our vet Dave McKellar was on hand at the sales and he was equally impressed by her following a vet examination. Pleased to report that her x-rays were perfect. The filly is VOBIS qualified and will be paid up for the rich VOBIS Gold scheme and she’ll be qualified to race in the rich Magic Millions Race Series. Prices per share are detailed below. Please note it covers ALL expenses right through until the end of August 2016.